Roadblocks to success can exist for every student at Delaware Tech. For Randy Miller, these barriers threatened to stop him from achieving his goal of graduating from the College with an associate degree. Miller was considered a non-traditional student when he began taking classes at Delaware Tech in his 30s in 1998. He even took a number of years off before returning to complete an entirely different degree. Through it all, he never lost his focus, resolve, or determination to graduate from college. “I already had how I would do it all mapped out,” Miller said. Step one was to change jobs, from working retail to working in admissions and registration at Beebe Medical Center in Lewes. 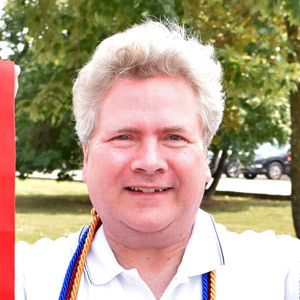 Once he started there in 2006, Miller knew that returning to Delaware Tech, and changing his major from computer information systems to office administration, would allow him to become a stronger employee. “I knew I would use the skills and information I learned in the department I was working in,” he said. Once he reenrolled in classes, Miller went on to step two – get involved in campus life. Miller discovered the Study Abroad program and jumped at the opportunity to travel to London in 2013. There, he fell in love with international education. Miller graduated in 2013 with his degree in office administration, and soon realized he already had most of his pre-requisites for a business management degree, as well as a general business degree. He reenrolled to earn both degrees and dove even further into student life and international travel. He joined the Phi Theta Kappa general honor society and Alpha Beta Gamma business honor society and served as an officer in both. He also went on four additional Study Abroad trips – Ireland (2014), Scotland (2015), France (2016), and Amsterdam/Belgium (2018). In addition, Miller took advantage of several other opportunities, including internships at La Esperanza in Georgetown and with Sen. Tom Carper’s office. Miller received his degrees in business management and general business in 2018. He is officially enrolled in the University of North Florida in Jacksonville, where he will be able to transfer 164 credits toward a bachelor’s degree in healthcare administration. His love and passion for international education has also spurred him to work toward a bachelor’s certificate in global healthcare. And he won’t stop there. Miller has plans to earn his master’s degree in healthcare administration, and would then like to work in the global healthcare field so he can bring together his passions for travel and healthcare.